Treat yourself to a memorable day trip to California's Napa and Sonoma Valleys. Fill your day with wine tasting, food, history, and culture from this famous wine growing region. 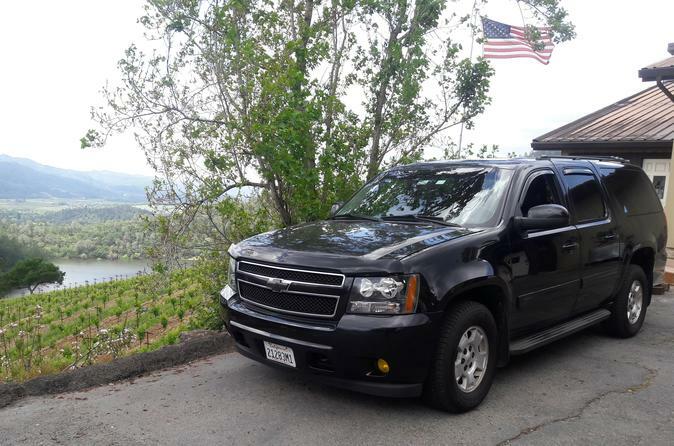 Travel across scenic Golden Gate Bridge and beautiful Marin County in a luxury SUV for maximum comfort and safety. You can swing by historic Sausalito on the way, if you wish. Tour duration is approximately 5 hours. Your tour will start anywhere in San Francisco. You will have a chance to see a little bit of a city on the way to the bridge of your choice. You can travel to Napa/Sonoma Valleys via both Golden Gate (recommended) and The Bay bridges. Travel across the bay and head up north to the one of the most beautiful places in the world. It will take about an hour before you hit first wineries in Sonoma. Sonoma plaza is one of the historic places if you prefer a little history with your wine. If you choose to go via Golden Gate Bridge you can also visit beautiful Sausalito on the way. It takes about one hour to get to Sonoma Valley from San Francisco, and one and a half hour to get to Napa Valley without traffic. This will give you around three hours of wine tasting. You can also choose to come back via a different bridge. Tour will be crafted to your preferences.